Windows Live Messenger 2009 has a number of available parameters you can use to start actions within Messenger without opening it up. You can use these for a variety of purposes, like scripts, hotkey/macro applications and anywhere else where you can start a program. You can use several at once, the actions will be executed in order. If you’re not familiar with adding parameters, to use these you’ll need to append the parameter to the end of starting the Messenger executable. For example, pop open the Run dialog by pressing the Windows key and R (or click Start then Run on XP, or in Vista/7 click Start and type in the search field at the bottom). 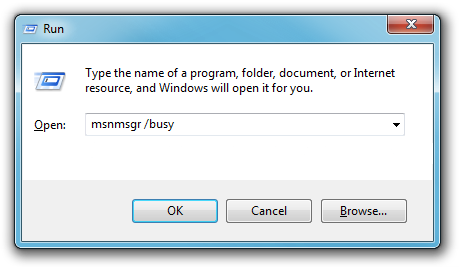 Then type msnmsgr /busy and click OK.
Now your status will switch to Busy within a few seconds. Try again with msnmsgr /email and you’ll see your Windows Live Hotmail inbox open. For fun, try msnmsgr /away /profile /sendim and you’ll see Messenger set you to away, then open up your Windows Live ID profile, and finally the “Send an instant message” window will appear. Note that in other applications (say a macro program or a script), you’ll need to specify the full path to the Messenger executable, which will be \Program Files\Windows Live\Messenger\msnmsgr.exe (Program Files (x86) on 64-bit Windows). Posted on May 28, 2009, in Uncategorized. Bookmark the permalink. 2 Comments. Yeah these ones are gone in 2011. But there’s two new ones for 2011 and they’re issued without a slash (these come from the jump list like before).